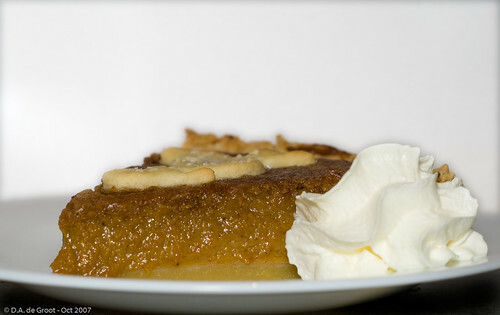 Recently I was inspired by Louise’s efforts at making Pumpkin Pie to have a go myself. I’ve had some cooked pumpkin in the freezer for some time now waiting for me to do something with it, and this seemed like a most excellent way to use it. Armed with a recipe from the ABC website I set about making my own variant of it. In a bowl, rub the butter into the flour until well combined and crumbly. Stir in the sugar with a butter knife, then stir in the egg yolk and a little water. Gradually add more of the cold water until the mixture forms lumps and leaves the side of the bowl cleanly. Knead the dough lightly and then wrap in plastic wrap and refrigerate until ready to use. When ready to use, roll out between two pieces of baking paper (to prevent sticking to roller and breakage of pastry) until about 5mm thick. Place in a greased pie plate, trimming off the excess. Blind bake at 220C for 10 mins. Combine all ingredients in a mixing bowl and whisk heartily. Once thoroughly mixed, pour into the pie base. Note on oven setting: I used the bottom element with fan assistance. You do not want to over cook the top of the pie. Bake at 220C for 15 mins then turn the over down to 170 and bake for a further 25 to 30 mins. (may need an extra 5 to 10 mins). The filling should be mostly set when done and will set further when cool. Cool on a rack for a couple of hours until set.